The Gandhinagar police has registered a case of theft of cash and jewellery worth Rs. 5 lakh from the house of ex-chief minister of Gujarat, Shankarsinh Vaghela. The FIR, lodged on Sunday, suspects a domestic help couple from Nepal. Police said that they are trying to ascertain the allegations which will take time as the suspects have left for Nepal. Vaghela’s house, a palatial bungalow named ‘Vasant Vagado’, is situated near Pethapur village on the outskirts of the Gandhinagar city. As per the complaint lodged with the Pethapur police, the chowkidar – Shambhu Gorkha aka Basudev Nepali and his wife Sharda – had allegedly stolen Rs. 3 lakh in cash and gold jewellery worth Rs. 2 lakh and fled to their native place in Kailali district of Nepal. The complaint quoted that the cash and jewellery were kept in Vaghela’s wife Gulab Baa’s room in the bungalow. “When the family asked other servants about the missing valuables, it came to light the couple was tasked with cleaning of the room where they were kept. “When Chavda contacted Shambhu over the phone, he promised to return soon. “However, when he did not return, it got confirmed that the couple had stolen the valuables from the room and then fled to Nepal,” the police said while adding an investigation in the case was underway. 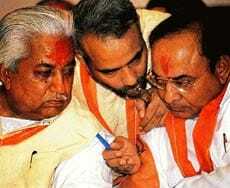 Vaghela shared a close relationship with Narendra Modi, who at that time, was just about breaking into the BJP ranks. He was also considered to be Modi’s mentor and the two were known to travel together on Vaghela’s Royal Enfield across the state. Interestingly, it was Modi who rallied behind Patel, and the motorcycle buddies soon found themselves pitted against each other as political rivals. A rebellion and a failed compromise later, Vaghela quit the BJP in 1997, commanding the backing of more than 40 MLAs.